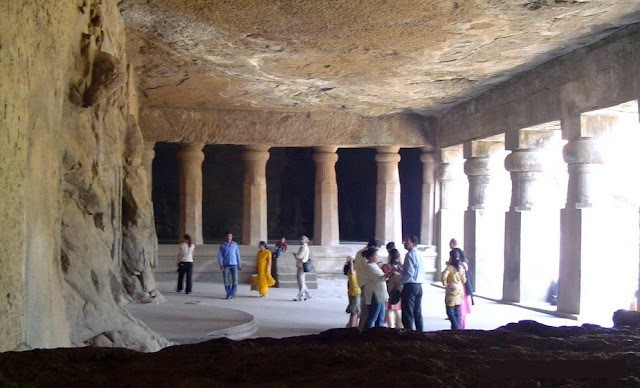 The Elephanta caves is a conglomeration of seven caves, out of which the most important is the Mahesa-murti cave. The main body of the cave, excluding the porticos on the three open sides and the back isle, is 27 metres square and is supported by rows of six columns each. The gigantic figures of ‘dvarapalas’ or doorkeepers are very impressive. The small island rises from amidst the pure and clear waters of the Arabian Sea like a giant round turtle. After disembarking, you need to take a narrow road to reach the site where the elevation begins. All along the way, the loud and cries of jamunwallahs can be heard, persuading you to buy the salted jamuns that they are selling. These plum colored fruits are sold in pouches cleverly designed to hold not more than 7 or 8 jamuns each. A steeply rising road will lead you to the caves located atop the island shaped like a hill. Then there is a flight of steps formed of sharp stones. Coolies carry the old and invalid up these steps in palanquins. Many aged visitors come here due to the religious aspect as some locals believe these caves to be dedicated to Lord Shiva. The tourist tax for adults is Rs. 10 and that for children is Rs. 5. Also, you are required to pay an entrance fee before entering the park. The fee is Rs. 10 for Indians and Rs. 250 for foreigners. There is a security check of your ticket at the entry to the site. You must insist on having your ticket back from the security guard who checks your ticket. The guard is only supposed to keep the detached control coupon. 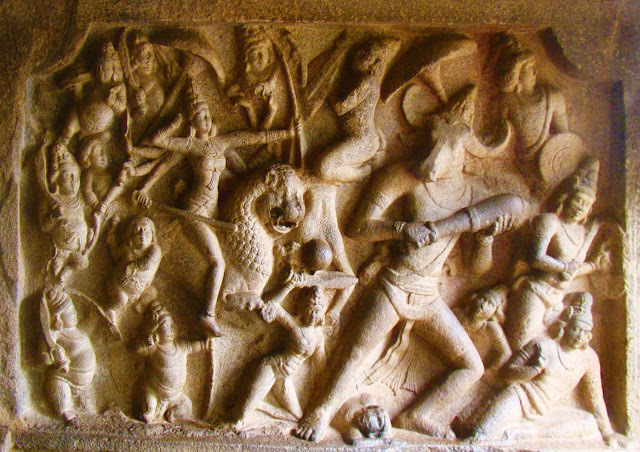 You must make sure you take your ticket backto prevent reselling of your ticket to another visitor as this way the entry fee which should go to the Archeological Survey of India would go into the guard’s pocket. You can visit several caves on this island. The guard would tell you of only five caves here, but some maps would show you 7 islands. All other caves except for the first two at the entrance are undeveloped and small. The Cannon Hill is the top of the Elephanta Island and you can walk up to this hill. Apart from old cannon, there is nothing else worth seeing here. Overnight stays on Elephanta Island are not permitted. However, if you want to rest during the daytime, the MTDH (Maharashtra Tourism Department Hotel) is a good place to take a quick siesta! This hotel also serves food and drinks. The check-out time at this hotel is at 5:00 PM. 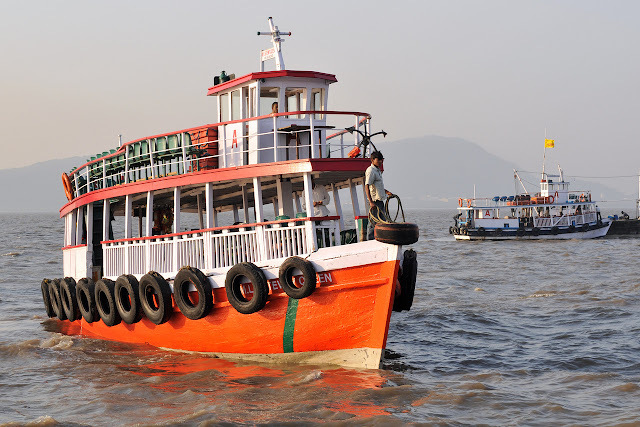 To go to Elephanta Caves, one will have to go to the Gateway of India in Mumbai and take a boat/ferry ride from there. The journey takes one hour by sea. Tickets for a deluxe boat are Rs. 140 for adults and Rs. 90 for children. Economy boats charge Rs. 20 less on both tickets. The first boat leaves at 9:00 AM and the last boat from the island leaves at 5:00 PM. 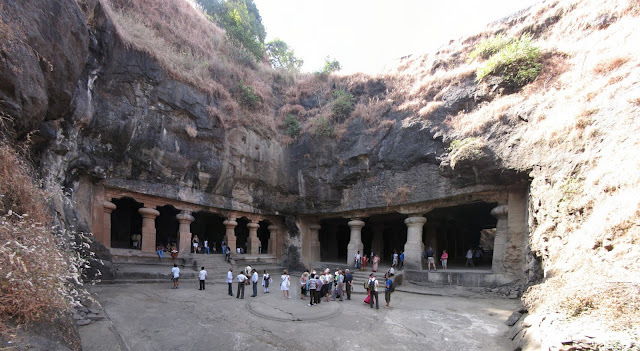 The Elephanta Caves is a great place to get away from the hustle and bustle of Mumbai metropolis. This trip to the caves will take you back in time, when faith, religion, hard labor, art and romanticism served as a base for everyday living. The Elephanta Caves are a glorious testimony to the aesthetics of a forgotten world and stand as one of the most popular tourist destinations, along with being a UNESCO World Heritage Site.